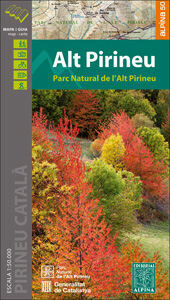 Alt Pirineu Natural Park in the Catalan Pyrenees on a contoured and GPS compatible map at 1:50,000 from Editorial Alpina. Coverage extends northwards from La Seu d'Urgell and Sort beyond the French border to Aulus-les-Bains. Accompanying booklet includes an extensive list of contact details for various types of local accommodation. The map has contours at 20m intervals, enhanced by relief shading with plenty of spot heights, plus colouring for different types of vegetation and/or land use. An overprint highlights walking trails, indicating where appropriate GR numbers of long-distance paths and the TRF (trans-frontier) routes. The map also shows recommended mountain bike trails. Symbols indicate various accommodation options (hotels, farms, refuges, campsites, etc), restaurants, nature centres and museums, etc. Local roads show car parks and locations of petrol stations. The map has a 5km UTM grid. Map legend includes English. Accompanying booklet with descriptions of recommended walks and more strenuous mountain climbs is in Catalan only, but includes an extensive list of contact details of local accommodation, recreational services, taxis, etc.